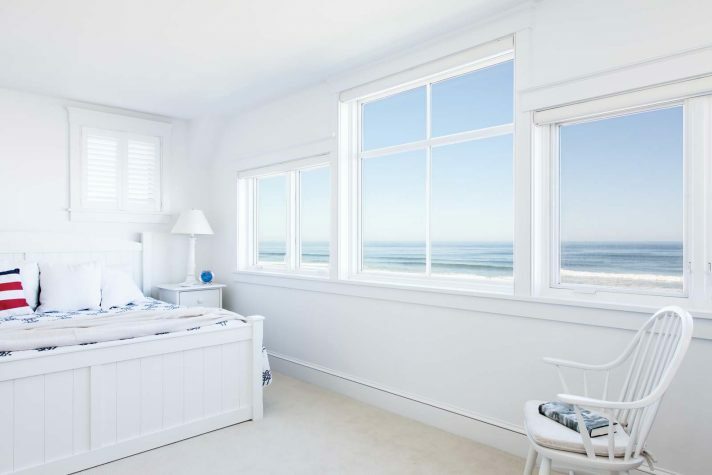 The first floor living features large square windows that provide a gorgeous view of Moody Beach. Outside, a large deck steps down to a tidy lawn where Carol Hall grows her tomatoes. The sea-facing side of the house is marked by large windows and a dramatic overhang (which hides hurricane shutters—a necessity when you’re this close to the water). The beach blankets are from Mexicali Blues. The owner’s suite features some of the best views in the house. 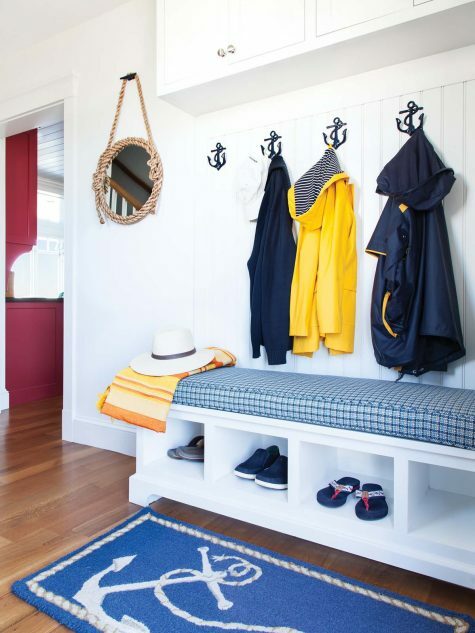 The entryway sets the tone for the rest of the home with its nautical decor and convenient cubbies for shoes and flip-flops. This red built-in cabinet houses wine, glasses, an extra sink, and other kitchen goods (built by Richard Moody and Sons Construction). Carol Hall believes that an L-shaped kitchen is best for cooking. A farmhouse sink makes it easier to make big meals for her children and grandchildren. The Halls are particularly pleased with how the millwork turned out. 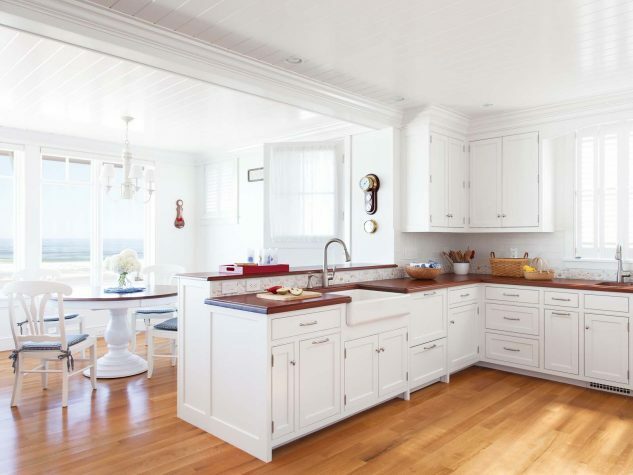 The wood countertops are by Sprague Woodworking in Harvard, Massachusetts, and the tile backsplash is from Wet Dog Tile in Alstead, New Hampshire. 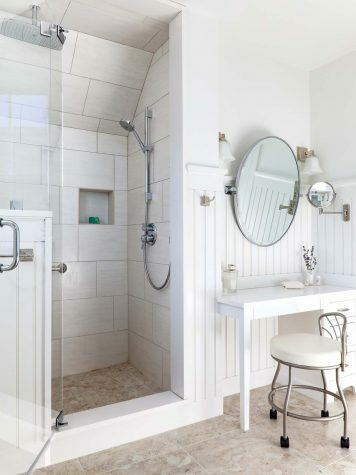 The upstairs owners’ suite bathroom is complete with a vanity area. One of the living areas downstairs converts to a guest room. Slipcovers made by Daybreak Workroom in York. 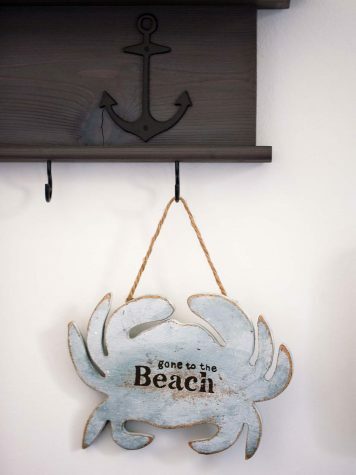 Nautical decor welcomes guests into the beach house. 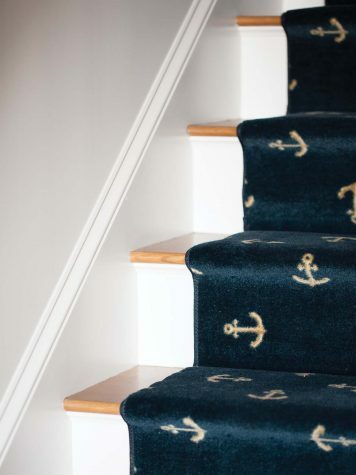 An anchor-printed stair runner leads to the upper level. A tide clock sits on a guest room bedside table. 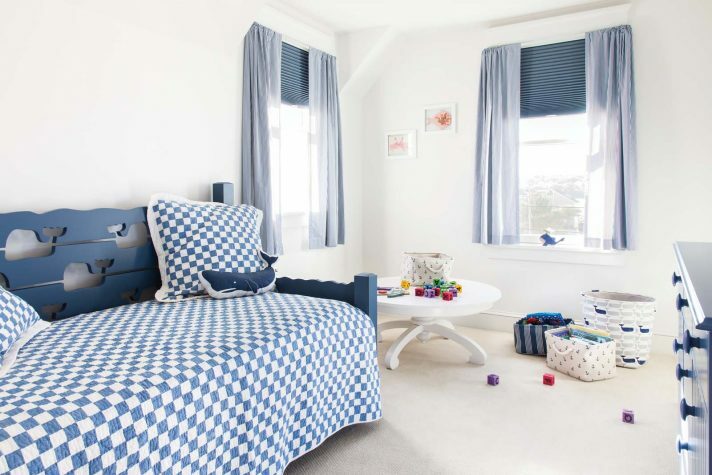 A blue wood whale bed, purchased at Cottage Home, adds a playful touch to the kids’ room. The street-facing side of the Hall’s home. 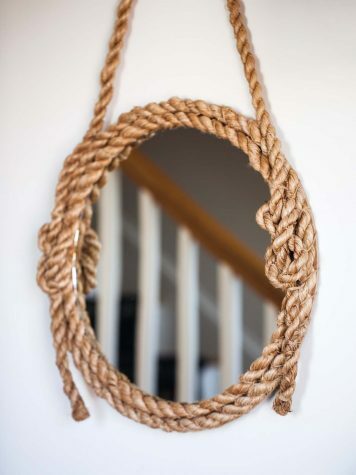 A rope mirror purchased from Anthony Catalfano Home in Wells hangs in the hallway. 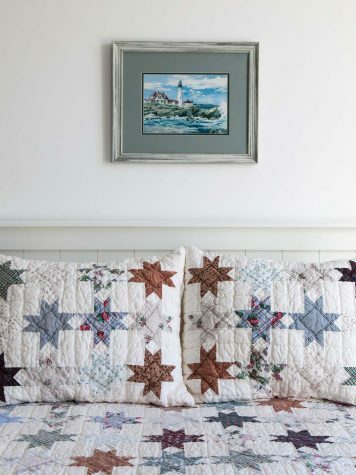 A cheerful quilt adorns an upstairs guest bedroom. “It was the first beach our children ever set foot on,” remembers Carol Hall. She’s sitting in the spacious living room in their Moody Beach home, looking out among large, square windows as the waves roll in. It’s winter now, and the surf has turned to ice, but her face lights up as she recalls memories of summer vacations, of long days spent outdoors. Her husband, Rick, sits next to her on the navy blue couch, sipping a mug of coffee that was brewed steps away in their open, all-white kitchen. The couple has been coming to Maine for over 30 years, first staying with family members and at rental properties. In 2009 they decided to purchase a beach home on Moody Beach. It was a small, modern structure, and for years it served its purpose as a weekend getaway quite well. However, in 2015 the Halls decided it was time for an upgrade. Rather than modify the preexisting structure, which would have involved more work since it required everything—from the foundations to the balcony—to be brought up to code, they made the choice to start fresh. 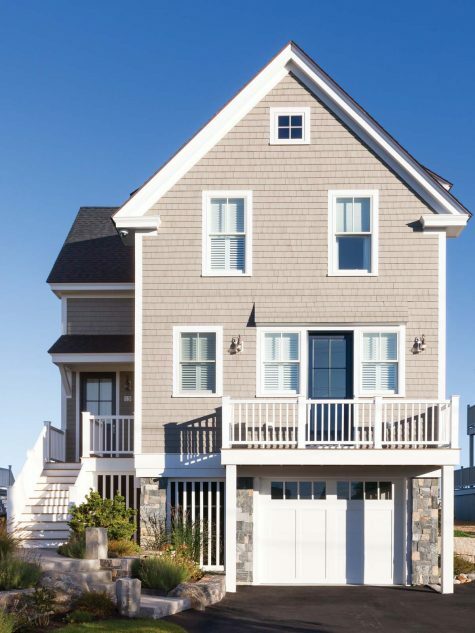 They hired Portsmouth-based DeStefano Architects to design the new beach home and local Wells builders Richard Moody and Sons Construction to build it. “We loved the old house, but it was dated. It wasn’t a truly four-season house, even though we used it that way,” says Rick. “We wanted to maintain the outdoor space, and we didn’t want to encroach upon anything preexisting, but we needed to get a little more space inside, too.” The couple’s family now includes two daughters-in-law and three young grandchildren as well as their two sons. It was important to Carol to add an extra bathroom so that each daughter-in-law could have her own private space when visiting. Juli MacDonald of DeStefano Architects agrees. 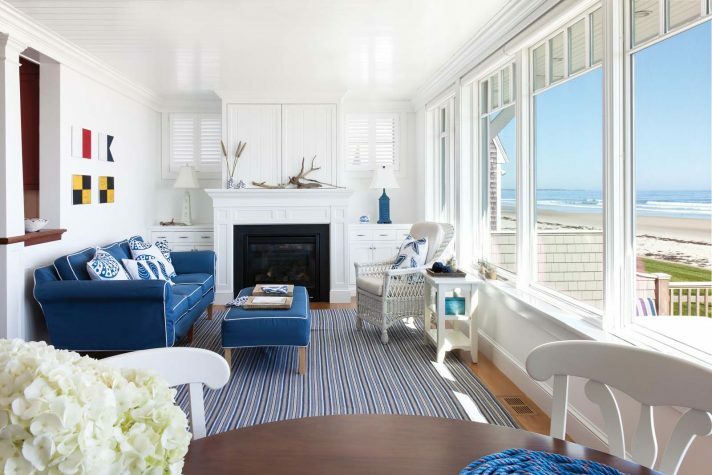 While her firm might typically suggest larger windows with lower windowsills on the beach-facing side of the home, this time they decided to stick with the preexisting windowsill height. “While the views were very important to them, they also wanted privacy,” she says of the homeowners. “Another element they liked in their existing house was that it had a very large deck that was just a few steps up from the line of the sand. We maintained both the size of the deck and the height.” Because of the structure’s close proximity to the water, they had to go through a “tricky state approval process.” They were able to expand to the north and to the west but not toward the south or east. Additionally, they were forced to do away with the preexisting basement because of new regulations designed to protect the fragile ecosystem of the beach. Fortunately, Moody knows this beach every bit as well as his name might suggest. 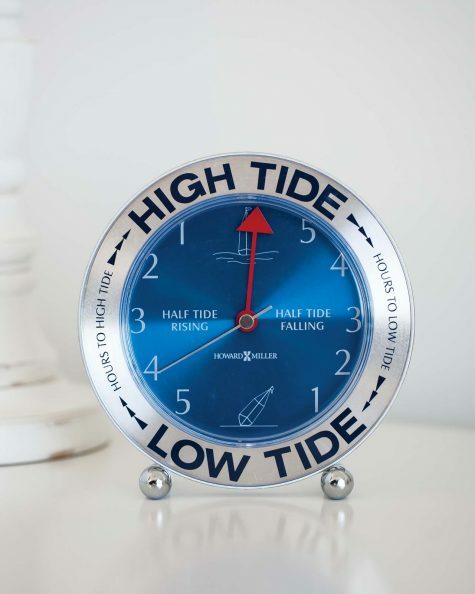 “Whenever you are building near the ocean, you try to use as little of the area as possible. It’s good business—it’s good for the neighbors, the homeowners, and for the environment,” he says. During construction, his team was mindful about debris and trash, managing the jobsite “much tighter than one inland.” Moody also says they needed to build the house on piers so that water could flow beneath it without damaging the structure of the foundation. “The vertical lattice you see now below the house meets the EPA requirements for water restriction, and the house is completely flood proof,” he explains. For Carol and Rick, losing the basement was a small price to pay for all they gained. 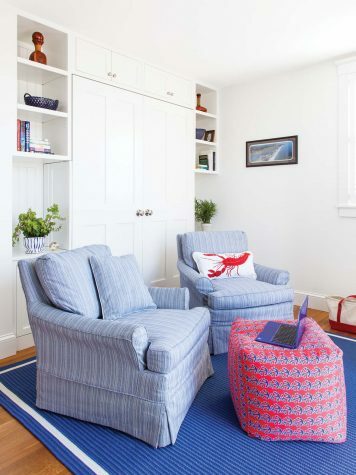 The ultimate goal was to create a beach house that was compact and functional, and could welcome in several generations of visitors, including those who are now just toddling around. The couple approached Moody with an idea to help keep the wee ones out of trouble: waist-high doors that pull out from the doorframe. After several design drafts and prototypes, he developed simple, functional pocket doors that blend seamlessly into the surrounding space. “I can’t tell you exactly how we did it, though,” Moody says. Turns out, the feature worked so well the Moody brothers are considering patenting it. While they are quick to praise the technical abilities of their team, Rick also says his wife played a pivotal role in the design process. 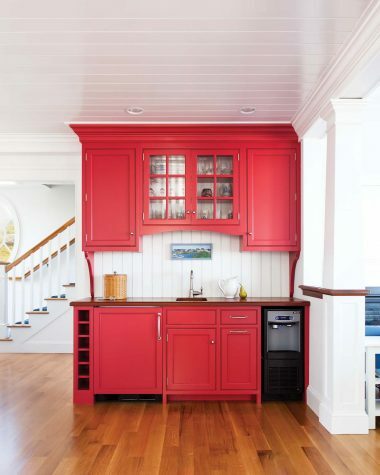 “She should get credit, because she’s done four kitchens at this point, and she knew exactly how to make the most functional kitchen possible,” he says with admiration. “A U-shape is best,” she adds. After 40 years of marriage, they clearly know how to play to each other’s strengths, and one of Carol’s strengths is cooking. “I’m Italian, so I love making big pots of tomato sauce to feed everyone,” she says. 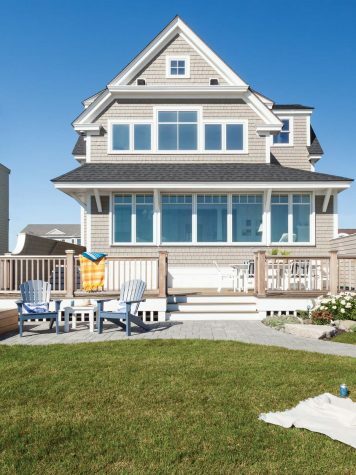 Although the couple’s primary residence is located in Amherst, New Hampshire, they say that building the Moody Beach home was an exercise in “thinking long term.” “We love where we live now,” says Rick, “but if push comes to shove and we decide to downsize, we would move here.” After three decades of vacationing on the sandy shores of Maine, the state has come to feel like home to the happy couple. Now, thanks to this updated, understated, and thoroughly comfortable beach house, it can function that way, too.